India took another major step in the country’s space program on Monday, successfully demonstrating an all-up orbital mission with their new Geosynchronous Satellite Launch Vehicle Mark III heavy-lifter that is envisioned to end Indian reliance on foreign launches vehicles. The 630-metric ton GSLV Mk. 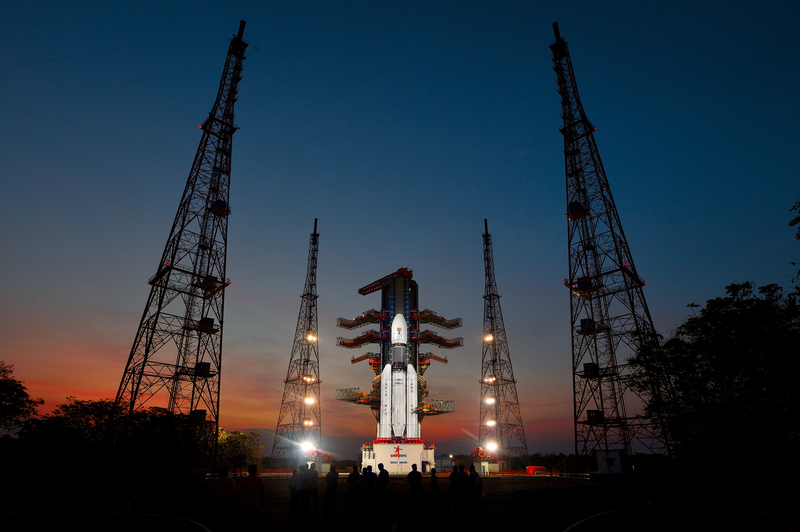 III thundered off from the Satish Dhawan Space Center on India’s East Coast at 11:58 UTC on Monday, 17:28 local time. Powering away from the Sriharikota range, GSLV Mk. III initially relied on its twin Solid Rocket Boosters before the large core stage joined in later in the flight followed by the boosters dropping away from the ascending rocket. However, the moment of truth came five minutes into the day’s mission when India’s most powerful cryogenic rocket engine ignited in space for the first time. It was a nail-biting burn of over ten minutes for the CE-20-powered upper stage and all eyes were on the performance graph that plotted out the real time trajectory of the mission. Loud cheers and applause emerged when GSLV Mk. III reached orbit after what appeared to be a picture-perfect ascent, sending the GSAT-19 satellite on its way to deliver high-throughput communications to India and test drive a number of advanced satellite technologies. India had been yearning for a heavy-lift launch vehicle of its own for the last ten years, but inevitable delays that came with mastering new technologies like cryogenic rocket engines ended up pushing the all-up debut of the Mark III rocket by nearly a full decade. The Polar Satellite Launch Vehicle that has become a workhorse for India’s space program since its debut in the early 1990s lacks the performance to lift heavy satellites into a Geostationary Transfer Orbit and instead can only host relatively light craft that start out in a sub-GTO orbit – leaving much maneuvering up to the spacecraft. For heavy satellites, India needed to contract foreign launch services providers like French-based Arianespace – a situation that was not deemed desirable politically and from a national security standpoint. 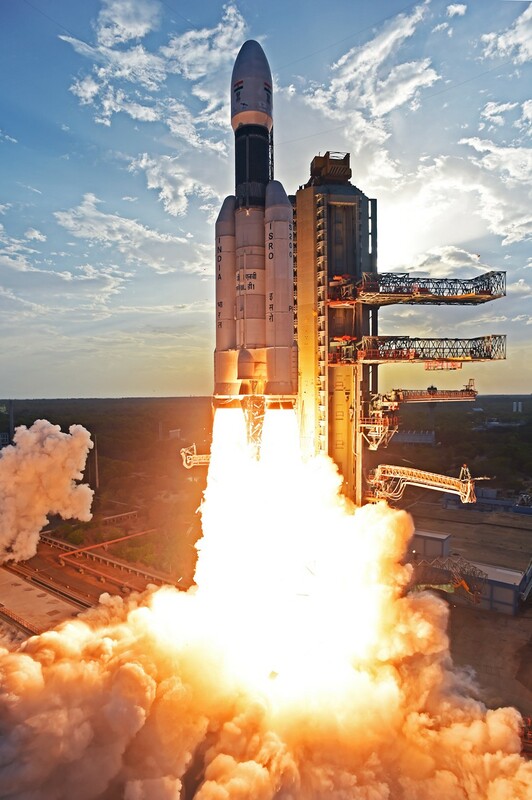 As a stop-gap measure, India initiated development of the GSLV in the 1990s to create an initial vehicle taking heritage components from PSLV and adding a cryogenic upper stage to create a launcher for medium-class geostationary satellites. However, even the initial GSLV Mk. I and II design would not be sufficient for heavier GEO satellites and India’s future crew spacecraft which prompted the initiation of the Mk. III project to realize a whole new launch vehicle concept that can satisfy the performance needs of all Indian satellite programs as well as potential human missions. GSLV Mk. III was expected to fly for the first time in 2009/10 when development work began in 2001 but it soon became apparent that a number of major hurdles would need to be cleared before the ambitious project would reach the launch pad. 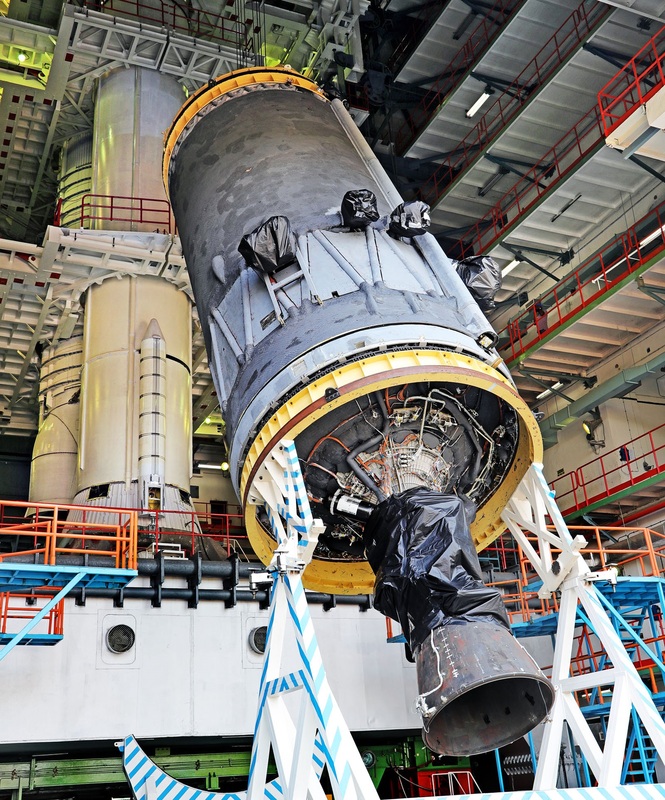 Initial missions of the original GSLV design had to use a Russian-built upper stage as India needed more time to develop an indigenous full- cryogenic stage. GSLV Mk. II with India’s first cryogenic rocket stage debuted in 2010 but failed at the point of upper stage ignition. Another flight in 2010 failed in its early stages and GSLV Mk. II went back to the drawing board for a top-to-bottom review that came up with a number of modifications to make the vehicle more reliable with particular focus on the C15 upper stage. This also meant a lengthy delay for C25, the bigger brother to C15 that was being developed for the Mark III vehicle along with a 200kN-class cryogenic engine. 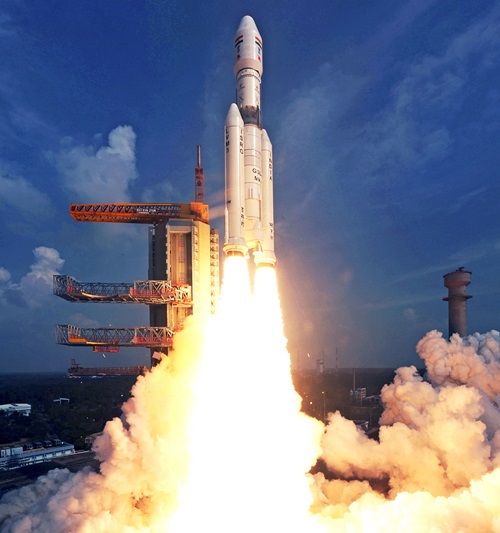 With the upper stage hopelessly behind schedule, ISRO opted to move forward with a sub-orbital test flight of the GSLV Mk. III in 2014 with a mass simulator standing in for the C25 stage in order to collect performance data on the two lower stages of the rocket and validate the overall aerodynamic design of the Mk. III including its five-meter fairing, the largest launched to date on an Indian rocket. Known as LVM3.X, the mission blasted off on December 18, 2014 and carried a prototype version of India’s future crew capsule, being lofted to a peak altitude over 125 Kilometers and a speed of 5.3 Kilometers per second to complete a re-entry demonstration putting to the test the vehicle’s heat shield, guidance technology and parachutes for a soft splashdown and recovery in the Bay of Bengal following a 19-minute flight. The initial test flight showed the overall design of GSLV’s boosters and core stage to be sound, but engineers identified some areas where improvements were needed. The nose cones of the boosters were changed to a tapered design toward the core stage and the payload fairing went from a cylindrical design to an ogive shape in order to improve the rocket’s aerodynamics and reduce loads experienced during atmospheric flight. The only piece missing for an orbital launch of Mark III was its 33-metric ton Cryogenic Upper Stage. Its smaller companion finally achieved a successful launch with GSLV Mk. II in 2014 and since then, Mk. II celebrated four consecutive successes – confirming India had mastered the technology of cryogenic rocket propulsion. 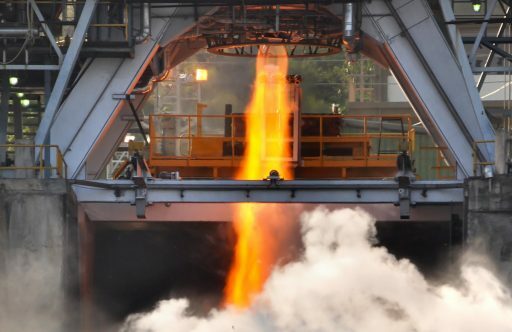 The C25 stage finally reached the test stand in early 2017 and completed an initial short-duration test in January followed by a full-duration firing in February – clearing GSLV Mk. III for its first orbital launch attempt. All in all, GSLV Mk. III stands 43.4 meters tall, its two-stage core is 4 meters in diameter and the rocket has a liftoff mass of 630 metric tons, capable of lifting 10,000 Kilograms into Low Earth Orbit and four metric tons into a standard Geostationary Transfer Orbit. It combines Solid Rocket Boosters (S200), a large hypergolic core stage (L110) and cryogenic rocket technology (C25) – harnessing the raw power of solids to get off the ground, powering into space with proven hypergolic engines, and then taking advantage of the excellent performance and impulse created by cryogenics for the final push to orbit. GSLV enjoyed a smooth countdown starting on Sunday to first fill up the L110 with 115 metric tons of UH25 Hydrazine mix and Nitrogen Tetroxide before the C25 began receiving 28 tons of supercold LOX and LH2 propellants that were kept topped up to flight level until shortly before liftoff. GSLV Mk. III raced off the ground upon ignition of the two S200 Solid Rocket Motors when clocks hit zero, ascending vertically before employing the gimbaled booster nozzles to put GSLV into its pitch and roll maneuver to begin a departure on a launch azimuth of 107 degrees, leaving Sriharikota island to the south east. The S200 boosters were the sole source of propulsion during the initial flight phase – a concept similar to the U.S. Titan III and IV rockets that also lifted off powered by their boosters alone followed by ignition of the core stage later in flight. Each S200 stands 26.2 meters tall and is 3.2 meters in diameter, holding 205 metric tons of ammonium perchlorate, aluminum and HTPB propellant to generate a peak launch thrust of 1,050 metric-ton-force when both boosters operate in unison. 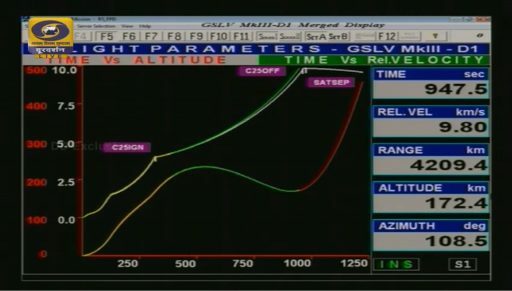 GSLV’s core stage kicked in one minute and 54.9 seconds into the flight when the rocket was 41 Kilometers in altitude and already going 1.6 Kilometers per second. L110 hosts two 78-metric-ton-force Vikas 2 engines – license-built powerplants based on the French Viking engine that used to power the Ariane 1 through 4 launch vehicles over a 25-year career ending in 2004. Declining chamber pressure on the two boosters triggered their separation from the core stage two minutes and 21.2 seconds into the flight, passing an altitude of 62 Kilometers. 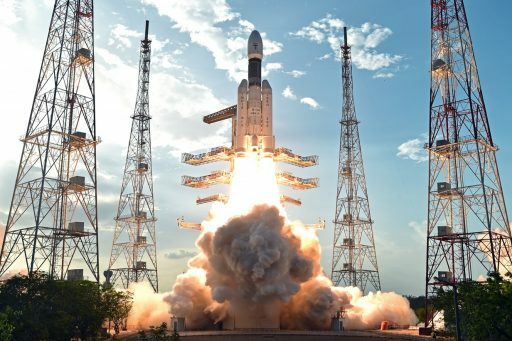 From that point on GSLV relied on the 21.4-meter core stage alone to lift the vehicle out of the atmosphere, guzzling down 560 Kilograms of self-igniting propellants per second. 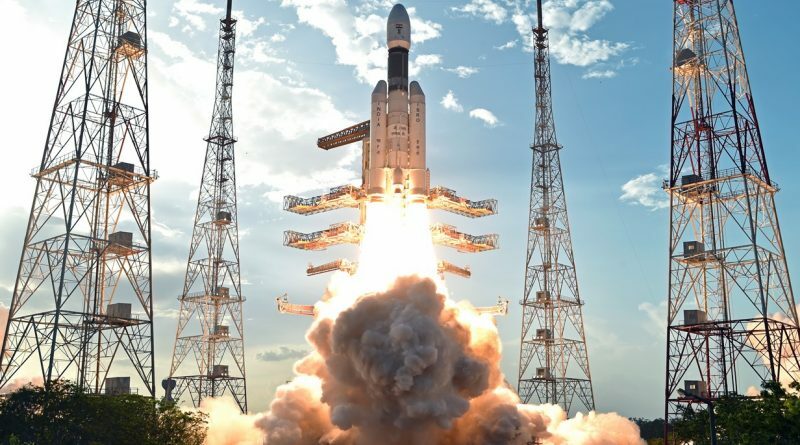 The five-meter fairing halves split open and dropped away from the rocket three minutes and 45.7 seconds into the mission when GSLV had passed 116 Kilometers in altitude where aerodynamic forces were no longer a threat to the delicate satellite structure. The moment of truth came just over five minutes after liftoff when the L110 core stage handed powered flight duties over to the C25 cryogenic upper stage. L110 boosted the stack to an altitude of 165 Kilometers and a speed of 4.4km/s, shutting down at T+5:17.6 followed one second later by separation and another two seconds thereafter was the planned ignition of the third stage. CE-20 soared to life and engineers on the ground called out a nominal start-up of the 200-Kilonewton engine – its first in-space ignition. It was a long burn of ten minutes and 25 seconds for the C25 upper stage and engineers on the ground who intently watched over engine parameters and the rocket’s trajectory as the stack accelerated by another 5.8 Kilometers per second to reach the desired injection speed. Ecstatic cheers emerged at Mission Control when the CE-20 engine shut down 15 minutes and 45 seconds into the flight after delivering good performance. 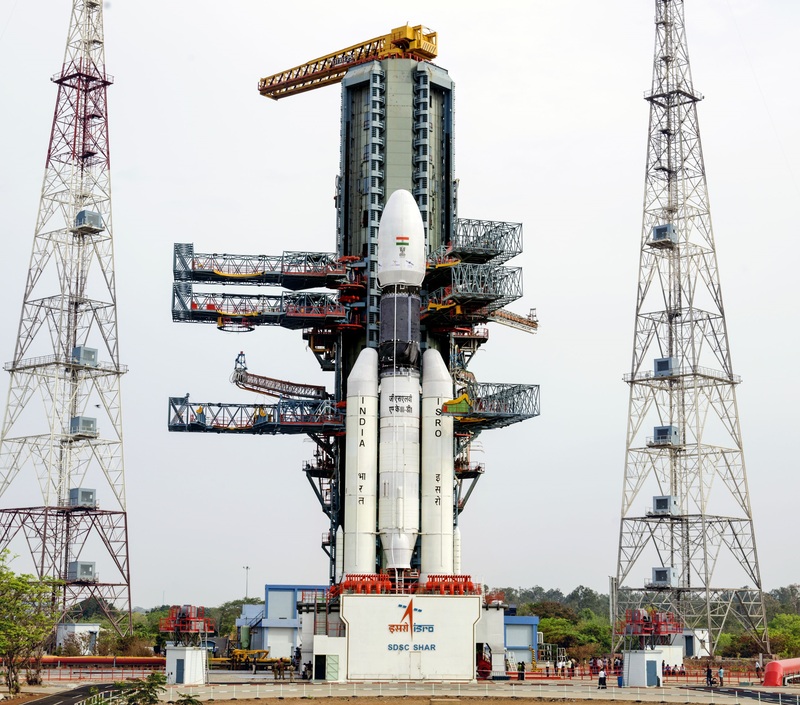 The GSLV Mk. III D1 mission targeted an orbit of 170 x 35,975 Kilometers, inclined 21.5 degrees and achieved orbital parameters were a close match. GSAT-19 – now the heaviest satellite ever to take off from Indian soil – sailed off 15 seconds after upper stage shutdown – marking a completely successful launch for the newest member of India’s orbital rocket fleet. The 3,136-Kilogram satellite has been built for a ten-year service life, outfitted with a high-throughput Ka/Ku-Band payload to support data-intensive telecommunications with a total capacity of 4Gbps. Its mission starts out with a series of firings of the Liquid Apogee Motor to maneuver into Geostationary Orbit where its orbital speed matches that of Earth’s rotation, allowing the satellite to maintain the same position relative to its coverage zone. 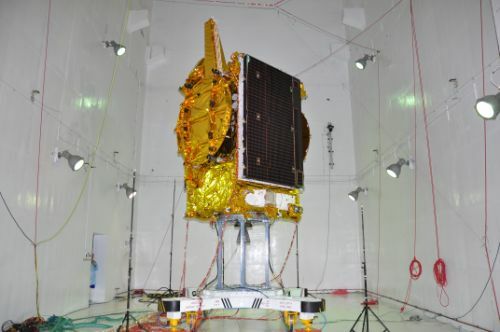 GSAT-19 hosts a number of advanced satellite technologies like Indian-built Li-Ion batteries, miniaturized heat pipe technology for more efficient thermal regulation, fiber-optic gyros for attitude determination, Micro Electro-Mechanical (MEMS) accelerometers, and a Ku-Band telemetry/telecommand transponder.